EARLY ON A HOT March morning, we find ourselves standing outside the Miami Dadeland Marriott hotel, waiting for the odyssey to begin. Our friends had told us we should start this book project with Bill Curtis. They said most of what we would see in the coming months had been, at least in part, created, improvised, explained, or experienced by Curtis. 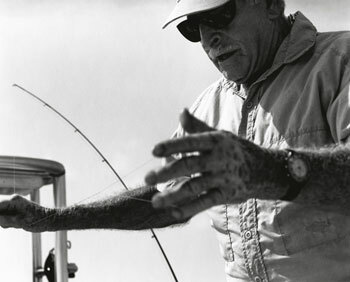 He is, by unanimous account, one of the fathers of saltwater flats fishing, and one of the last living legends of this game. But the best part of the story is that Bill Curtis, now in his late seventies, is still playing it. He arrives, five minutes early, in a Chevy Astro Minivan, pulling a canary yellow skiff, the “Grasshopper,” straight through the mix of valets and bellhops, who trade confused glances as he wheels up to the front door, occupying both lanes of traffic, and stops. He rolls down his passenger side window, barks at the doorman, then asks us if we’re here to fish. Before we have time to answer, he opens the van’s back doors and is loading equipment. Eventually, we would learn that Bill Curtis does things his way, and the rest of the world can deal with that. We pack up and head out into traffic toward the Dixie Highway. A half-century ago, when Bill moved here, this neighborhood was on the far, rural edge of Miami, but today, it is consumed with the sprawl of strip malls, shopping centers, office complexes, and car dealerships. If not for the palm trees on the roadside, you might think you were in suburban Detroit or Denver. We are a moving anachronism, pulling Bill’s little yellow boat through six lanes of traffic. Nobody says much beyond introductions, until he asks where we want to start. We don’t have one answer. We want him to open his bag of tricks and teach us to fish, anywhere. 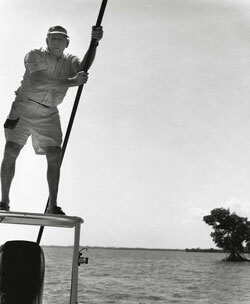 More importantly, we want him to tell us how the whole story started — poling the Everglades with a long, wooden dowel and a weathered plywood skiff, the enormous schools of tarpon and bonefish that since have disappeared, a day fishing with Ted Williams, what it was like to be the only boat on Biscayne Bay — but where does it really begin? We find a mixed bag of small jacks, spotted seatrout, ladyfish, and pompano, throwing gaudy, rattling “Cajun Thunders” and shrimp-tipped jigs into the channel with spinning rods. In doing so, we extract some of Bill’s basic history. He tells us he is from eastern Oklahoma, and learned to fish in New Mexico in 1934, throwing Adams flies with split-cane rods on the San Juan River under the guidance of his uncle. He even held the world record for rainbow trout on six-pound tippet for a fish he caught up in Alaska, but could care less, when we ask, about its length and weight. relatively uncharted realm of the flats. He began guiding in 1958. There are other guides, contemporaries, who have received more attention and acclaim than Bill over the years. There was a feature in Sports Illustrated back in the 1960s, and a permit show for the original “American Sportsman,” not long after that, but Bill did not enter the profession to become a star. He says he was drawn by the work, the fish, and the experience, and never spent a whole lot of time worrying about getting noticed. WELL, I’d better get on the stick,” says Bill, gingerly climbing onto the poling platform. Whoosh, whoosh. The sound of the push pole sliding through Bill’s calloused and worn hands makes a distinct sound, like a dry eraser rubbing up and down a chalkboard. His deftness on the platform almost defies logic, but when we learn he is the inventor of said contraption, his surprising agility begins to make more sense. Whether they realize it or not, many of today’s guides have been influenced by Bill Curtis. 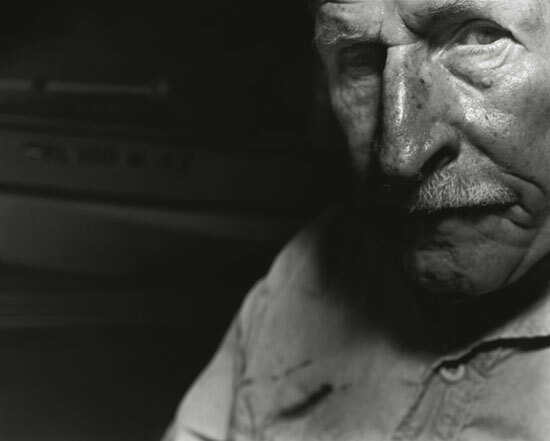 He has designed and developed shallow water boats like the Hewes Bonefisher, the first production flats boat; tested products for the Ted Williams Tackle Company; introduced and created indispensable fishing knots, including the “Bimini Twist” (which he brought to Florida) and the “Curtis Connection” (his own invention); and made countless other improvements to tackle and technique during his 50 years in the sport. If you look hard enough, you will notice his contributions marking the flats boats of the world like indelible fingerprints. Watching Bill’s hands tie intricate knots is like watching an old maestro play the piano with fingers slowed by age (but nonetheless, graceful and deliberate as they pass over the keys). Bill says the best anglers have natural grace, and he never has fished with anyone more graceful than the late Ted Williams, the finest hitter in the history of baseball. 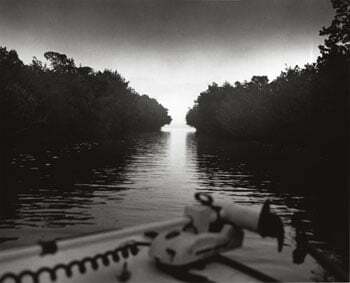 THE NEXT DAY, we are ripping across Biscayne Bay toward the tarpon, bonefish, and permit flats on the east side. With his white, sunworn knuckles loosely rolled over the wheel and the throttle wide open, Bill Curtis is in his element. He has guided everywhere from the Bahamas to the Dry Tortugas, from Flamingo to the Keys, from the Crystal River to north of Homassasa, but this is his home water, and where he made his name. He also played a significant role in the preservation of these fish and these remarkably productive flats. Bill helped found Bonefish and Tarpon Unlimited, and recounts for our benefit former trips in the early 1960s, scouting and fishing with Stewart Udall, then Secretary of the Interior, and Luther Hodges, the Secretary of Commerce. We watch a cigarette boat tear across the horizon. It is one of hundreds of watercraft — party boats, ski boats, WaveRunners, sailboats, even dozens of undaunted anglers — crisscrossing and running through the fragile, mottled green waters of the bay. Bill had told us to expect this as we waited in line to launch his skiff at the public landing. It is still worth seeing, he said, and who knows, we might run into a bonefish or permit if we head far enough south. Anyway, he has a special place he wants to show us. RETREATING from Curtis Point, we flnd a hidden bay where the dense, waving turtlegrass yields to white sand depressions, aligned across the bottom like triangular white flngers on a backgammon board. It doesn’t look like anyone has been here, at least not for a few hours. He reaches into the storage chest and pulls out a small hand-crank food processor, tosses in a fistful of brown shrimp, and starts grinding. When flnished, he takes two heaping handfuls of ground up protein and throws them off the front of the boat. Bill explains that when loud boat motors send the nervous bonefish running for deeper water, it sometimes takes a little “special sauce” to coax them into playing. The fish flnding game may have changed over the past 40 years, but most of the fundamentals, like the bonefish cast, have not. Bill tells us to keep a low proflle, and leave our casting hands below our shoulders. He picks up the rod and starts wiggling it overhead to illustrate his point. The dropping afternoon sun exaggerates the rod’s shadow. He says any change in light, caused by a bird gliding overhead, a passing cloud, and particularly a flagging fly rod, will signal danger to the bonefish, and scare them off. We wait, drink some water, and wait some more. “It’s a permit alright. You might as well give him a shot, because he won’t stick around for long,” Bill says, tossing the last chunk of sandwich overboard. We wind up with two false casts, off to the side, then drop the fly at the target. It looks like a pretty decent shot — in front of the fish, maybe a foot long, but not bad. The permit tilts down slowly to inspect the fly and refuses. Annoyed, confused, or amused the 25-pound permit turns, momentarily, to reveal his pale chrome flank, like a beat up trash can lid, then vanishes into the grass. Bill isn’t surprised, and he isn’t disappointed. Of all the fish on the flats, permit are the most flckle and unpredictable. You usually only get one shot, and they are notorious for refusing the fly, even when the cast is perfect. Bill has witnessed this routine many, many times, enough not to expect their cooperation, or believe in beginner’s luck. “These permit know the difference between meat and potatoes,” Bill utters. “Was the cast okay?” we ask, seeking to rationalize failure, or flnd some level of approval from our captain. 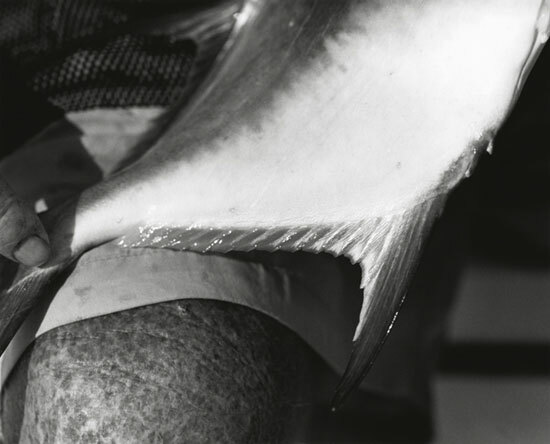 ALMOST ALL good writing on Florida flats fishing — especially stories on the uniquely gritty, sometimes cutthroat guiding culture of the Keys — reflects, intentionally or not, the persona of Bill Curtis. 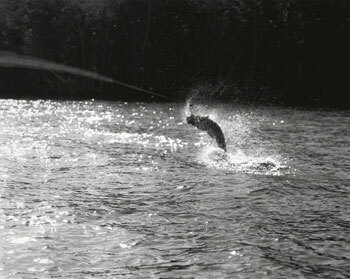 It is hard to read any story about this area’s fly-fishing heydays, turf wars, wild adventures, or working character, without somehow seeing Bill Curtis in the pages. Bill likes writers, or so he says. He tells us about days on the water with Carl Hiassen, and recounts a prolonged tarpon battle with Jim Harrison, a flght that only ended as night fell, when both men conceded the fish would drag them to Mexico if they didn’t cut it off. Bill’s favorite story involves another writer and angler with whom he had a run-in near Key West, roughly thirty years ago. “He had a 17-foot center console Mako, and decided to race me for this little channel, but my Hewes Bonefisher was just a little faster. So I made the cut before he did, trimming up my engine so he would eat my spray as I ran across Northwest Channel. When we got into Garrison Bight, I really hosed him out. Some time later, mutual friends would introduce Bill Curtis to Thomas McGuane. They eventually forged their own, respectful friendship. EARLY on the last day, Bill stashes the push pole, and kicks on the electric trolling motor to slide us along the east edge of Oyster Bay. 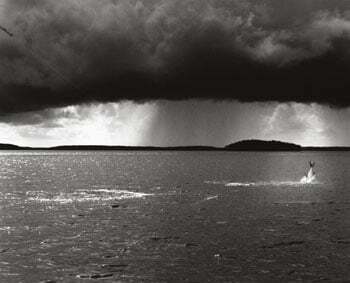 Although the water is discolored, there are droves of 100-pound tarpon rolling and crashing ladyfish across the flat. As we blind cast, Bill says to be patient and keep working ahead of the boat, it will pay off sooner or later. “Nice cast,” Bill shouts down from the platform. “Now shoot another on the backhand, ahead of these fish rolling at three o’clock.” When Bill Curtis says “nice cast,” it is tall praise, and certainly enough to keep the faith and the effort going. “Come on ‘poons … eat the fly,” he utters. Suddenly, there is rock-hard tension at the end of the line. The tarpon grabs the Greenie Weenie, only 20 feet from the boat, and gives us a jaw-dropping flrst glance, flashing below the stained surface like a sunken, aluminum canoe. Time stands still, long enough for everyone, except Bill, to trade wide-eyed, startled glances as the fish rolls in the tannic water and starts pulling away from the boat. We set the hook just like Bill told us — three short, hard tugs to the side, like a hammer driving nails into fresh wood. The tarpon makes three successive, greyhounding jumps, and each time we bow to the fish, so he won’t spit the hook or break us off. But shock turns to panic when we realize there is a problem: The wind has blown a few loose coils of fly line across the deck, and tangled them around the stashed push pole. Three hands scramble to twist loose the spaghetti-like mess, but the fish already is streaking into Oyster Bay. In another second, the tarpon is off, busting the 20-pound leader like an afterthought. “It happens,” says Bill, quietly. He offers consolation, but cannot hide his own disappointment. Then he gathers the fly line and starts the long process of building a new leader. He tosses us another fly from the box and tells us to start sharpening it. MEGALOPS ATLANTICUS, the tarpon, is among the most sought-after gamefish on the Florida flats for its strength, size, and remarkably acrobatic fighting style. One hook up, one jump will have visions of the “silver king” cartwheeling through your dreams for the rest of your angling life. With large, armor-plated scales and gills, a deeply forked tail, and a mouth like an upturned trap door, tarpon are prehistoric creatures. Nearly unevolved from 100,000 years ago, they still swim with mystery and wonder. Only recently have scientists discovered that they are among the longest-living fish in the ocean. By measuring the carbon deposits on the otoliths (earbones) of tarpon, a process akin to carbon dating dinosaur fossils, experts now know that tarpon can live for 50 years or longer. It seems strange to imagine the possibility that Bill Curtis could catch a tarpon today that was born before he began guiding in 1958. 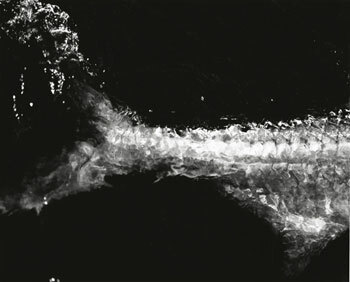 In addition to breathing through gills, tarpon also have evolved the amazing ability to breathe in poorly oxygenated waters by breaking the surface and gulping air; the ingested oxygen is passed along to a highly specialized swim bladder where it is dispersed throughout the fish’s blood stream. Scientists are unclear whether this unique breathing ability is an adaptation for juvenile survival (allowing the young to avoid predators in low saline back waters), or a means for adults to exploit the rich, brackish feeding grounds of many estuarine environments. Even the where, when, and how of tarpon spawning are uncertain, though scientists do know that they engage in a primal, pre-spawn ritual where groups of fish swim in symmetrical, head-to-tail circles called “daisy chains.” Bill recounts how he once found himself in the middle of three, nonintersecting (externally tangent) daisy chains near Homosassa in the late 60s, and simply sat and watched the hypnotic motions of hundreds and hundreds of fish without making a cast. In all his years, he only has seen this occur once. It is clear that Bill has enormous respect for the tarpon. Driving home from the Everglades on our final afternoon, we feel more than satisfied having fished and learned from Bill Curtis for three days. We feel honored. It is as if we had just played three rounds of golf at Augusta with Arnold Palmer. Bill Curtis has been more than gracious, more than patient, and, in return, our respect for his game has grown tenfold. It is matched only by our respect for the man, and the beautiful, fragile waters where he has worked for all these years. 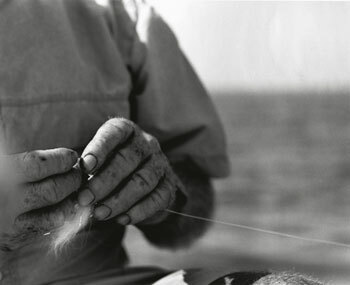 Back at Bill’s modest house, watching him tie original tarpon patterns, we notice that the man and these places he has poured his blood and sweat into have become reflections of each other. Like wind and rain carving away at sandstone, time and overuse slowly have worn down Bill, the Everglades, Biscayne Bay, and the Keys. In reality, some estimate that 90 percent of the reefs in the Keys have died in the time that Bill Curtis has lived here. 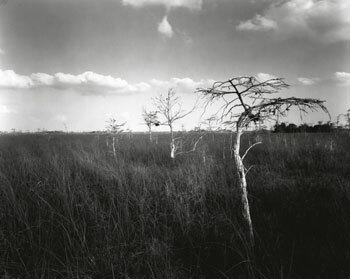 The Everglades are depleted, burdened by water diversions, development, agriculture, drought, fires, and more. “I only hope the Everglades come halfway back to what they were 50 years ago, before I die,” says Bill. At least there is hope, and more than that, resilience. Resilience in the land and in the man, to keep fighting on, keep pressing forward, and keep running one step ahead of time. There also is a lesson, and now a legacy, which cannot be conveyed in passages from a book, in a movie, or on television. 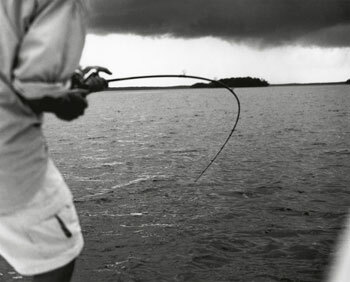 The lesson and the legacy are about grace and perseverance, about growing old with honor, and about battling the elements, the fish, for as long as you can. At nearly eighty years of age, Captain Bill Curtis still is chasing 120-pound tarpon on Oyster Bay. When the time comes, how many of us will be able to make that claim? otherwise, you’re hunting witches or stars in the afternoon. but that’s no guarantee he’ll eat or even look at your fly. he’s either stupid or you’re lucky to catch him at all. like you went to church to pray then started begging. maybe better, coming to look at your fly. You might pray now.